NATO: "We deeply regret the tragic death of this Afghan civilian"
KABUL, Afghanistan (CNN) -- An Afghan man was killed in an airstrike by coalition soldiers supporting NATO-led forces in eastern Afghanistan, officials said Sunday. 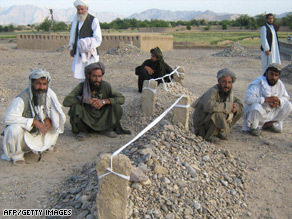 Villagers sit near the graves of victims of recent airstrikes in Garni, in western Farah province. The man, who died at a hospital in Kabul on Wednesday, was not setting up improvised explosive devices as originally suspected, NATO's International Security Assistance Force said in a news statement. Afghan National Army soldiers were the first to arrive at the scene in Paktia province. They provided first aid to the victim before he was taken to the hospital, according to ISAF. The international force said it will work to ensure no more civilians are killed. "We deeply regret the tragic death of this Afghan civilian and extend our condolences to his family and friends," said Capt. Mark Durkin, ISAF spokesman. "ISAF treats incidents involving innocent Afghans very seriously, and we will continue to work very hard with local authorities to avoid civilian casualties." The ISAF was formed under a U.N. mandate to bolster a secure environment and support the reconstruction of Afghanistan. NATO took command in 2003. The force comprises about 50,000 troops from 42 countries, according to its Web site.